Rock climbing is fascinating to me. You have to be in great shape, smart and very skilled to excel at it. To me I see a significant risk of climbing up the side of a rock with just ropes, but I like to stay firmly on ground, thank you very much. 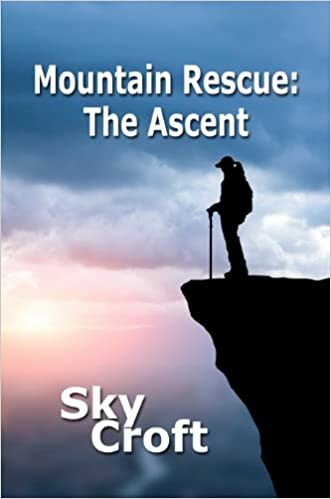 So anyone who can scale a rock wall is pretty awesome in my opinion, and that is exactly the reason I picked up Mountain Rescue: The Ascent by Sky Croft. Kelly Saber is a fierce, competitive mountain climbing badass. She volunteers to rescue climbers who have become lost or injured. When Saber is not saving the lives of those in peril she can be found cooking up delicious meals in her small village’s only restaurant. There is literally nothing this superwoman can’t do. Dr. Sydney Greenwood has just moved in Kelly’s little town set in the Scottish Highlands. This ER doctor becomes fast friends with Saber and her merry band of mountain rescuers after they bring in an injured climber. Syd being an expert climber herself has a ton in common with Saber and her buddies. The bond of friendship is almost instantly formed. Syd and Saber become instantly connected and easily slide into best friend status. These two will spend basically every second of the book together. Both ladies have had troubled past, Saber with her parents and Sydney with her former partner, so neither easily jumps into wanting a relationship, but there is a connection they just cannot deny. When they do finally go for it, I can tell you they are all in. The book was just okay for me. I wasn’t displeased by any means. I just didn’t feel any lasting emotional connection to the story. There is very little conflict in novel, and I think that is why it didn’t stir any feelings for me. I liked it, I just didn’t love it. I would however read something again by this author for sure!